Seasonal fluctuations in climate are a concern for all in agriculture. Seasonal extremes of rainfall, solar radiation, and temperature can reduce crop productivity to levels that put stress on the farm business. Prolonged periods, even years of climate stress can erode at a farm’s equity and even lead people to exit a business. Adversity is the stimulus of innovation and this is the driving force behind alternative agriculture. The early 1990’s saw a groundswell of interest in managed rotational grazing as a viable alternative to confinement dairy farms. This business model has progressed from an alternative to wide use on Wisconsin dairy farms and proven highly profitable (Kriegl), with high levels of satisfaction (CIAS). Drought can pose a threat to this model both in levels of profit and farmer satisfaction. Response to drought on Midwest dairy grazing operations has brought the innovation and adoption of several strategies. Planting summer annuals for grazing, including field corn, pearl millet, or sorghum-sudangrass hybrids has proven a valuable method for managing the “summer slump”. Other strategies include adopting perennial forages that have greater drought tolerance such as tall fescue and reed canary grass, increasing legume components of swards, or using delayed release nitrogen fertilizer products. Irrigation of forages has typically only been economically viable in water deficient areas of the US. The use of irrigation infrastructure has grown continually in Wisconsin’s vegetable industry, while irrigation on forages has not been extensively used until recent periods of drought. The commercial appearance of “pod-line” irrigation systems, during this prolonged period of drought, has sparked interest in their use on Midwest grazing operations. The underlying soil type supporting the pasture will vary in the effectiveness of irrigation. Research conducted in 2009, on silt loam soil on a farm in the same general area of Wisconsin showed no significant yield increase with pod-line irrigation of the pasture, nor were there significant increases in forage quality. Silt loams have physical properties that allow them to store nearly twice the available water than a sandy loam soil. The nature and property of your farm soils is detailed in your local County Soil Survey. 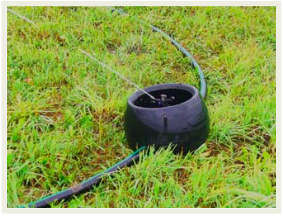 Pod line systems consist of a single or perhaps two risers in a grazing paddock that connect to a thick walled low density polymer water line. Along this line are sprinklers contained in pods spaced 50’ apart with as many as 13 pods on a line. The pods offer protection to the sprinkler from overturn and from livestock manipulation. The pod-lines are moved once or twice daily to deliver a band of water 50’ wide and the length of the pod-line. 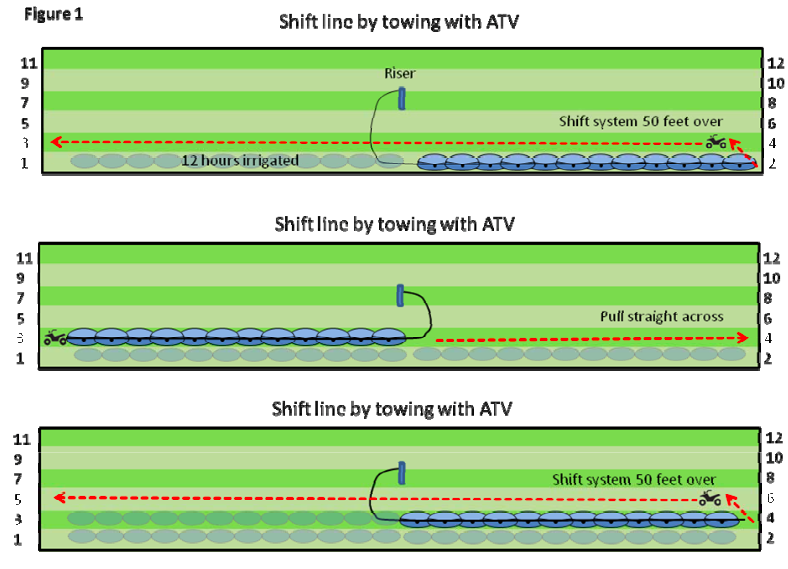 The line is moved with the use of an appropriately sized ATV or UTV with the entire line pulled across the field. A pattern is followed (Figure 1) to appropriately cover the field, it will take multiple days to cover the field. Multiple lines can operate on a given farm with installations varying from tens to hundreds of acres. The water delivery cost of the pod-line systems should be relatively constant on a given farm on a per acre basis. Supply well and feed line water development on the farm will depend either on the capacity of the planned system or supply capacity of the water source. Making a capital investment in irrigation requires careful study of the hydrology of the farm’s surface and groundwater resources. Development of the water resource is a long term investment which may or may not make a financial return year after year on Wisconsin grazing farms. The potential for no annual return is the greatest risk for operators choosing irrigation. An analysis of 3 Wisconsin farms employing pod-line irrigation showed a lifetime fixed cost of $31-$59 per acre year, predominantly made up of ownership costs of the well and pod-line irrigation system. The wide range of costs reflected the level of investment farmers had in their wells. The summer of 2009 was a very dry summer. Total rainfall amounts for the farm were 7.25 inches from June 15th to September 30th, which was well below the normal of 15.5 inches for the region. In 2009, irrigation on the Onan Farm produced 1.5 tons more Dry Matter Forage than non-irrigated areas of the farm (Table 1) during the “summer slump” (July-August). This was accomplished with 9.5” of irrigation water. The approximate total cost of operating the system in 2009 was $135 per acre, but returned 1.5 tons dry matter of dairy quality forage valued at $258.75 (1.725 as fed tons X $150/ton) for $123 in net returns. During the period in which many grazing dairies struggle to maintain pasture growth, this farmer was able to maintain a 21 day rotation. In 2010, the cost of owning the pod-line system was $67 per acre, representing a loss from no gains in production. The cumulative benefit of pod-line irrigation 2 years into operation is approximately $68 per acre. Clearly the economics of a pod-line irrigation system can benefit a pasture-based dairy in a severe drought. But in extreme wet years the fixed cost losses are a drag on the long-term benefits of this practice. To be cost effective in the long run, the pod line irrigation benefit must return or exceed both ownership and operating costs. One of the advantages of grazing is producing dairy quality forage at a low cost per ton. Adding irrigation infrastructure increases the cost per ton of pasture produced whether you use it or not. We know from the Onan farm that we can count on approximately 2 tons of production in the summer under ideal conditions. If pasture costs only $60 per ton to produce, it comes at a significant savings over grown or purchased hay. 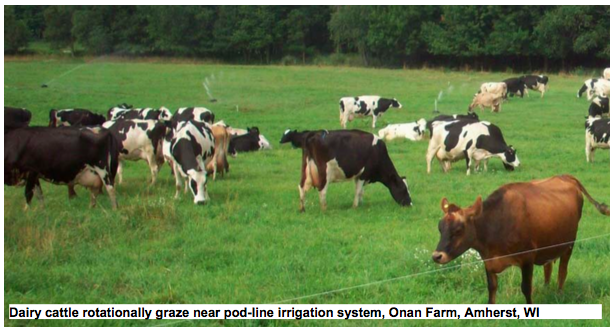 However, owning an irrigation system without even turning it on will increase the cost the pasture per ton on the Onan farm by $35 per ton ($70 per acre). So we’ve increased the cost by more than 50%. Now if we apply water, we know on the Onan farm that operating costs are just over $16 per acre inch of water. So if we go without rain for two weeks, and it takes 3” of water or $50 to make up for it, we’ve increased the cost of pasture by another $25 per ton. So what began at $60 per ton is now $120 per ton. Another 3 inches of irrigation would increase it to $145 per ton, and so on. And with these costs per acre, one needs to evaluate the use of more conventional forage production systems. We wish to acknowledge the contributions of several individuals in this work including: Teal Fyksen and Brian Nischke, Golden Sands RC&D; Paul Onan, dairyman; Rick Adamski, dairyman; and Tom Kriegl, UW Extension, Center for Dairy Profitability. This study was supported by Grazing Lands Conservation Initiative research grant.